NOTE: Your location could not be determined. To display the next nearest Dealer, please click on"Use my location" or enter the desired location details manually. We are happy to be at your service! Where can I buy Biohort products? Biohort products are available at our local distributors - see dealers in your area - or through our online shop. Are deliveries to Switzerland possible? Deliveries to Switzerland occur only through our general importer Neogard. Will transport costs be incurred? Generally not! In the following countries no transport costs arise: Austria, Germany, France, Netherlands, Belgium, Luxembourg, Denmark, Great Britain, Ireland, Sweden, Finland and Spain. The delivery address has to be located on the mainland and must be accessible to a 38t-lorry. We deliver Biohort products free of charge to the distributor or directly to your home address. If a delivery to an island is required please ask for the corresponding extra charges. How much do Biohort products cost? Prices can be found at our local dealers or online at our online shop. May I ask for a quotation for a required product? Quotations can be requested at our local dealers or at our online shop. Where can I buy spare parts for Biohort products? Replacements can be purchased directly form our customer service at office@biohort.com. Is an assembly service available? Yes, please find our certified Biohort assembly partners and recommended prices under assembly service! What additional costs should I expect? Please be sure to ask about additional costs before commissioning our service partners! What length of delivery time should I reckon with? We deliver all standard products (garden sheds & storage solutions) within 3 weeks after receipt of order. The delivery time for custom-made solutions (i.e. shed extensionrelated-products) is approx. 4-6 weeks. Can I fix a delivery date when placing the order? Of course, you can announce a desired delivery week. Please indicate this on your order. How do direct deliveries work? If desired we deliver directly to your home address. Depending on the weight and size of the goods the delivery will be effected by a parcel service or forwarding agent. Deliveries by the parcel service (LeisureTime Box 100 / 130, PAKET-BOX and small accessories) are made WITHOUT a prior advice. If the delivery is made by the forwarding agent, the forwarding agent will contact you as soon as the goods have arrived the last depot of the forwarding agent. Then you can arrange the concrete delivery date within the following 6 workdays - on this day you will receive your delivery during the day. For deliveries by the forwarding agent ("free kerbside") please indicate your telephone number where you are available during the day. Are kerbside deliveries to islands possible? For any information about deliveries to islands please contact your dealer! The address isn't accessible to a 38t-lorry. Are deliveries with a smaller lorry possible? Please contact your dealer if a delivery with a 38t-lorry isn't possible! Which delivery options can I choose? Generally, a date of delivery can only be arranged with the forwarding agency. Deliveries are possible from Monday through Friday. Unfortunately, an exact time of delivery cannot be arranged, since it depends on the route assigned to the forwarder. What can I do if I'm unable to accept the delivery at the arranged date. Please indicate any upcoming holidays, business trips etc. when placing your order. Should you for any reason be unable to accept the delivery at the prearranged date, please contact us immediately at office@biohort.com. 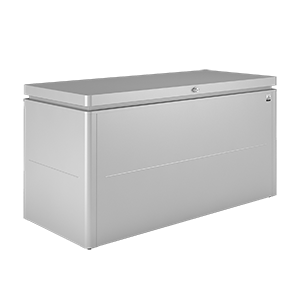 Are the StoreMax, HighBoard, LoungeBox, LeisureTime Box and PAKET-BOX delivered finished-assembled? No, all Biohort products are packed in corrugated cardboard boxes for self-assembling. What should I pay attention to, when accepting the goods? the correct colour and size is delivered. What does "delivery free of charge" really mean? "Delivery free of charge" means the transport from our stock to the indicated delivery address (only within mainland), kerbside (no transport into the garden or garage!). How and where do I apply the sealant? The silicon sealant is used to seal the contact surface of the bottom of the profiles and top of foundation. To apply the sealant proceed as follows: after mounting lift the shed up about 5 cm. Set a wooden wedge under each of the 4 corners and apply a generous bead of sealant under the bottom profiles. Remove the wooden wedges, lower the shed onto the sealant and secure it to the foundation. The adhering and sealing surfaces must be absolutely clean and dry. Please make sure that the drainage holes in the profiles are not filled with sealant. Can I handle the packages alone? Due to their size and weight, we recommend that the packages are transported by at least two people. Please notice that the forwarding agent is only responsible for kerb-side delivery and is not obliged to carry the packages into your house or garden. How are Biohort products packed? Our products are intended for do-it-yourself-assembly and are packed as individual components. Depending on the product ordered, these components are packed separately in either one or more corrugated cardboard cartons, which are clearly marked on the outside. Wooden battens and plastic matting is used to provide additional protection for Fragile or breakable parts. The disposal of the packaging material is the responsibility of the customer. Are Biohort products easy to carry? Depending on the sizes, all packages are provided with handles or grips to facilitate their transport. We recommend the packages to be handled by at least two people. Depending on the product, one package can weigh up to 73 kg. What should I consider if I do not open the packages immediately after delivery? In this case, please make sure that you store or keep the packages in a dry place. 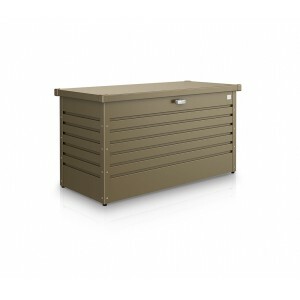 Which types of foundation construction are to be recommended for the Garden Shed/Equipment Locker? 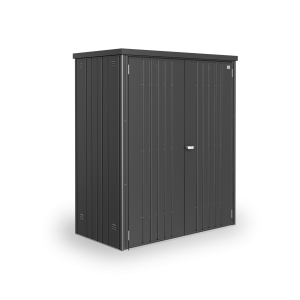 The simplest solution is to install your Garden Shed or Equipment Locker directly on to a Biohort Floor Frame (without any extra foundations – cross section 40 x 40 mm) and secure this with the ground anchors provided. The space inside the Floor Frame can then be filled out with the optional Alu-Floor panels or with paving slabs. An effective and economical solution can be achieved by laying paving slabs (40 x 40 cm or 50 x 50 cm) in a gravel-bed. Paving slabs are commonly available in a variety of colours and finishes from almost every Home worker and DIY market. Even when due care is taken to ensure that the paving slabs are firmly and evenly placed in the gravel, we would still recommend the use of a Biohort Floor Frame to ensure stability. A reinforced concrete foundation is without doubt the best solution. Even with this type of foundation you must take measures to ensure that no water can enter the garden shed from ground level. A shouldered foundation with a step of 2 cm x 7 cm running around the circumference is the ideal solution. Another useful alternative to ensure secure, storm-proof erection of the Garden Shed on soft and uneven ground is to combine the Biohort Floor Frame with a point foundation. The foundation points should be positioned at each of the four corners of the shed and have a minimum size of 30 x 30 cm. The excavation should be of an adequate depth to ensure protection against frost. The shed along with the Floor Frame should be firmly attached with the mounting hardware supplied - 2 times at each of the four foundation points. 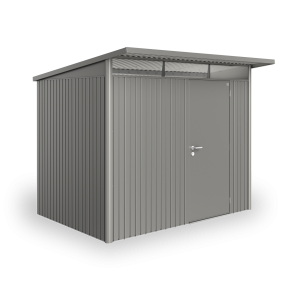 What must be considered during the preparation of the Garden Shed/Equiment Locker foundations? Storm-proof anchoring must be ensured during erection. Local weather conditions must be taken into account. The mounting hardware (screws and dowels or ground anchors) are included in the delivery. 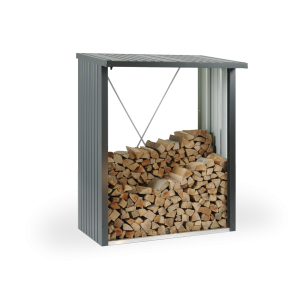 If the garden shed is positioned, without a concrete foundation on frosty or soft or uneven ground – we strongly recommend the use of a Biohort-Floor Frame. Do I need the Biohort aluminium floor frame to install the shed properly? We highly recommend the use of a Biohort floor frame for all types of foundations, except in the case of a concrete foundation with step. Is it necessary to prepare a foundation for the StoreMax 120, 160 or 190? Are special skills required to assemble Biohort products? All Biohort products are delivered with detailed photo illustrated assembly instructions. Assembly of our products requires no specialtechnical knowledge. If you cannot perform or organise the assembly yourself, we will be glad to offer our assistance. Our certified installation contractors can be found under "construction service". Are special skills or tools necessary to complete the assembly? Suitable socket keys-and open-end spanners are included in the delivery. How much time is required to assemble Biohort products? A) Skills of the "assemblers"
How many people are required to complete the assembly? Where can I find the assembly manual for my Biohort product? Each Biohort product is delivered with detailed assembly instructions. For the Europa, AvantGarde and Highline Garden Sheds, the assembly instructions are packed in cardboard box # 3. You can find the required assembly instructions and download them directly from our Download Center. What preparations should I make before I begin with the assembly? Check the delivered goods are complete (correct size and colour, check for signs of damage). Ensure that sufficient space is available and depending on the product ordered, ensure you have additional person(s) to assist you with assembly and installation. Please take the time to read the photo illustrated assembly instructions in advance! Do you offer an assembly service? If so, how much do you charge? Our certified installation contractors and guideline prices can be found under "construction service". What do I have to pay special attention to when assembling Biohort products? The basic requirement is a flat, horizontal building site! Open the package in accordance with the instructions. Please protect the sheet metal parts from scratches. Wear gloves during installation - parts may have sharp edges. What exactly is a 'sealant' and what type should I use? Sealant refers to silicone- resp. butyl-beading materials, which are suitable for outdoor use. It is important that the sealant does not include acetic acid. Suitable products are available in the building trade. Can I erect a Biohort Garden Shed on sloping ground? A flat, horizontal construction site is absolutely essential for positioning the shed! What weight of snow will the Garden Shed stand up to? 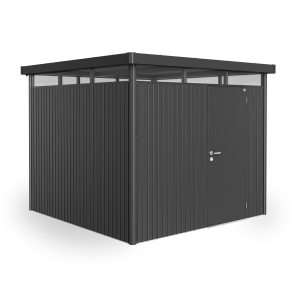 The roof of our garden sheds is extremely sturdy and can withstand snow loads of up to 150 kg/m² (CasaNova 215 kg/m²). However, avalanches can cause roof damages. Are Biohort products resistant to stormy weather? In order to avoid damages in case of stormy weather, all Biohort products must be secured to the ground floor using the mounting parts provided, such as anchors and dowels. Biohort declines any kind of responsibility for damages caused by inadequate mounting of storm proof anchorage. Are Biohort products secure against burglary? Most Biohort storage solutions are fitted with a lockable twist-grip, a cylinder lock or a door with a profile cylinder lock. 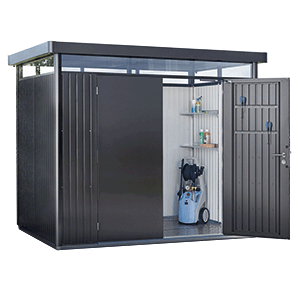 Biohorts -Garden Shed/-Equipment Locker/-LeisureTime Box/-PAKET-BOX/-StoreMax can therefore be defined as a "lockable container" and the contents can be insured up to a defined value limit against burglary. Of course even locked Biohort products can be opened with the appropriate force. Our garden sheds "HighLine", "AvantGarde" and the annexe "CasaNova" provide the highest levels of security against burglary. When we speak of a burglary, we generally mean a ‘break-in’ or forced entry accompanied by theft. That is to say, if the burglar, by the use of force and with aid of tools, illegally-built keys or with keys that have been previously acquired by burglary or robbery, gains access to a secure building with the intent to steal property stored within. A burglary also occurs if the offender manages to overcome barriers and barricades or to enter through openings not designed to admit access or through an act of stealth obtains access to secured premises. Finally, the entrance into and removal of objects from locked containers or premises is also defined as an act of burglary. What sort of maintenance do Biohort products require? Biohort products need almost no care and maintenance, due to the high quality of the materials and their careful manufacture. Just lubricate the lock and the hinges once a year. Clean the shutter guides of the StoreMax regularly resp. lubricate them with silicone spray. If the products get dirty caused by climatic and environmental influences, use only water and the Biohort CleanLine universal cleaner. It is also possible to use a high-pressure cleaner, as long as you keep a distance of min.10 cm and use no steam cleaner. Max pressure approx. 80 bar. For conversation of the painted surface, we recommend you the Biohort CleanLine conservation, which optimally protects the painted surface from climatic and environmental influences. In cases of scratches, varnish the spots affected with some lacquer. Important: Salty and/or sandy ambient air, aggressive and scrubbing cleaners, thawing salt, fertilizers and other chemical materials (never store products opened) can attack the lacquer painted and zinc surface and cause rust damages. Claims under guarantee cannot be granted. Which roof inclination have the garden sheds? Which materials are Biohort products made of? Biohort garden sheds have proven their quality for over 30 years. Our hot-dipped galvanised, polyamide coated steel plate is supplied by the worldwide renowned Austrian Voestalpine steel mills. Premium car manufacturers, such as Mercedes-Benz, BMW and Audi, have all placed their trust in the high quality of "Voestalpine steel" for years. It is therefore with good reason and a clear conscience that we can offer our customers a 20-year guarantee against corrosion. Some components are made out of aluminium, which means a considerable reduction in weight and adds to the durability of our products. How is the Garden Shed ventilated? Ventilation is provided by 11 mm wide slits between the metal roof panels and the roof supports or via concealed ventilation slits. The circulation is ensured thanks to a constant flow of air. What steps can one take to prevent the formation of condensation water? During assembly it is important to ensure that a moisture barrier against rising damp is installed (see foundation proposal garden shed). High air humidity and large variations in temperature can result in condensation forming on the inside of the roof overnight. This can be prevented by attaching 2 cm thick polystyrene panels (or for HighLine 3 cm XPS rigid hard foam panels) inside the roof. These panels are available in all DIY-stores. The garden sheds "AvantGarde" and "HighLine" are already prepared for the insulation of the roof interior. 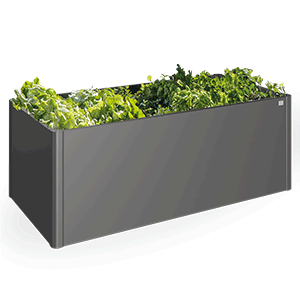 For the garden shed "Europa" additional fixing material can be ordered via the Biohort customer service. Is it loud inside a Biohort Garden Shed by heavy rainfall? It is very difficult to gauge noise levels, an accurate indication is impossible to measure as this always depends on personal tolerance. Rain drops depending on strength and intensity as it falls upon the roof, window sill and trees, generate a certain background noise level. To reduce the noise level, you can insulate our products HighLine, AvantGarde and Europa. The inside of the roof of the garden sheds "AvantGarde" and "HighLine" are already prepared for insulation. For the garden shed "Europa" additional fastening material is offered. Are the "feet" of the LeisureTime Box/PAKET-BOX adjustable in height? Depending on the size of the box, 4-6 plastic legs are assembled. These are not adjustable in height. Can the seat cushions also be stored in the LeisureTime Box during winter? 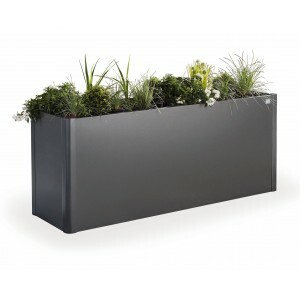 Please note: the LeisureTime Box/PAKET-BOX is driving rainwater proof. There are slots integrated for a good ventilation. Cushions may attract humidity and therefore shouldn't be stored inside the box during winter - risk of mould stains! Is it contemplated to use the Leisuretime Box as seating furniture? The LeisureTime Box / PAKET-BOX are not designed to use them as a seating furniture. Which weight does the floor of the LeisureTime Box endure? The floor of the LeisureTime Box / PAKET-BOX is able to endure an even weight of 20 kg. 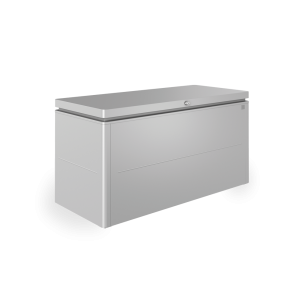 For storing heavy objects in the box, we recommend you to lay a 20mm thick insulation plate under the floor. 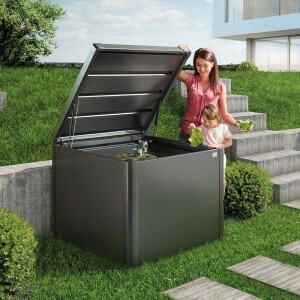 Is the LeisureTime Box rainwater proof? Due to it's construction the LeisureTime Box / PAKET-BOX is driving rainwater proof. Is it possible to assemble the garden shed Europa on a roof terrace? In accordance with the building requirements, the assembly of a garden shed on a roof terrace is legal. IMPORTANT: Make sure, that your garden shed is fixed storm-proof (fixing material is already included in the delivery). No liability can be assumed for damages caused by insufficient fixed Biohort-products. Is it possible to attach the Equipment Locker to an exterior wall of a house? 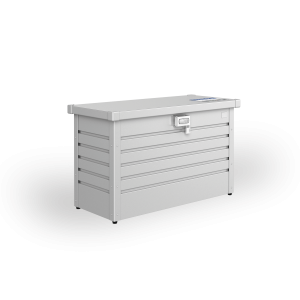 The Equipment Locker is designed for free-standing use. Please ask us for wall fixing materials. Is it possible to use the StoreMax for storing pumps? If you want to use the StoreMax for storing pumps (e.g. for swimming pools), corresponding cable bushings (electricity, water etc.) are necessary. This is NOT prepared. Please note, that the pumps circuit must be closed. Cases of escaping chloro-water-mixture can cause corrosion. Please note, that in these cases the guarantee expires. Is it possible to replace single lamellas of the StoreMax? The shutters of the StoreMax are two-part. In cases of damages, it is possible to replace single lamellas of the front roller shutter. Lamellas of the top roller shutter cannot be replaced. Is it possible to erect my WoodStock freely? It is possible to integrate accessory for my "WoodStock" like the back wall/door wing subsequently? The optionally available accessory parts can also be integrated subsequently. Are accessory parts (shelves, tool holders...) available for the WoodStock? 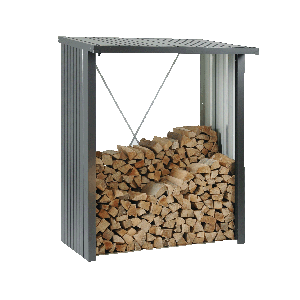 The "WoodStock" is drafted as a firewood storage solution. Therefore accessory parts like shelves, tool holdes etc. are not offered. Is there a rain water downpipe available for the WoodStock? No, a rain water downpipe is not offered for the "WoodStock". Can I keep animals in a Biohort Garden Shed? Biohort-products are not designed for keeping animals. Can the garden sheds be insulated at a later date? Biohort products are designed as storage solutions. When required insulation can be mounted on the inside of the roof of the garden sheds. The sheds of the series "AvantGarde" and "HighLine" are already prepared for a roof insulation! 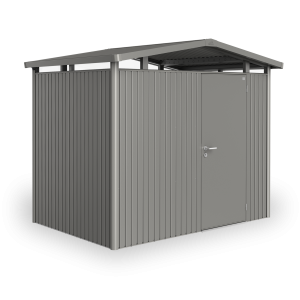 For Sheds of the series "Europa" we can offer additional fastening material for fixing roof insulation. How high is the sill by the door entrance? The height of the door threshold is normally about 30 mm. When using the optional aluminum floor frame (cross-section: 40 x 40 mm), the height of the door threshold increases to approx. 70 mm. How far can I open the door? How big is the angle? Is it possible to place the roof overhang in any position? Because of the construction it is not possible to change the position of the roof overhang of the AvantGarde. How can set/adjust the door gap on the tool shed? Depending on the foundation design chosen, it may be necessary to adjust the door gap. The door gap can be readjusted by moving the hinges (long slots), the side wall elements (long slots), and if necessary, by adjusting the floor frame profiles (long slots). Can the optional aluminum floor frame be retrofitted? The optional aluminum floor frame for the smaller products can also be installed afterwards - with little extra effort. Can the optional extra door be retrofitted? An optional door panel or extra door can be retrofitted. However, please take into account the additional work required. We recommend you plan the desired door configuration in advance of or contact our customer service. Can the garden shed door be fitted to open to the left? For Europa/Equipment Locker/WoodStock (twist grip cylinder lock) you can freely choose the door hinge position. For AvantGarde and HighLine (stainless steel door handle) a left-hand hinge is possible upon request and with extra costs. Are the Biohort colours assigned to match RAL numbers? This colour has no similarity with a RAL-colour. We recommend to look at our dealers the original color samples. Is it possible to deliver different products with the same lock? As a rule all Biohort products are supplied with different locks. However upon request (and depending on the product range selected), door handles with identical locks can be supplied later. For further information, please contact our Customer Service. How many bicycles can be stored in a Garden Shed when the BikeMax holder is used? 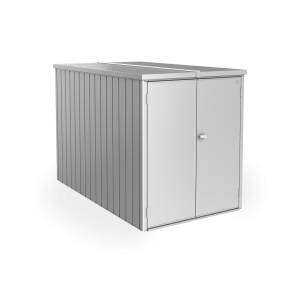 The following specifications for the garden shed Europa are applicable for medium-sized bicycles with a rim diameter of max. 26" and a maximum length of 175 cm. At the gable ends of garden sheds Europa size 3 onwards, it is maybe possible to position bigger bicycles. The following specifications for the garden shed AvantGarde are applicable for medium-sized bicycles with a rim diameter of max. 29" and a maximum length of 185 cm. If you want to store your bicycles on the back wall, we recommend you the floor frame. Is there enough room in the Garden Shed to store bicycles? 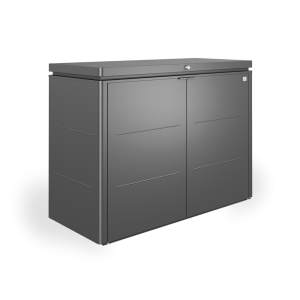 When the optional bicycle holder "BikeMax" is used, up to two bicycles with wheel rim diameters of 24 "and a maximum length of 175 cm can be stored in the Equipment Locker. One BikeMax can be mounted on each side wall. Where can the BikeMax be positioned and how can it be attached? 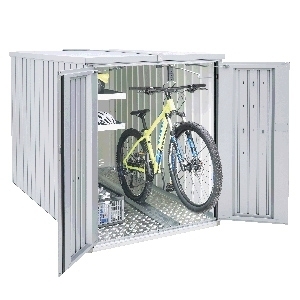 The bicycle holder can be fitted into the Biohort garden sheds (plug-in system). Thanks to the V-shaped profile, not only bicycles with narrow tyres but also mountain bikes can be securely stored. The bicycle is hung from the front tyre rim in such a way as to ensure that the bicycles own centre of gravity prevents it from falling over. The bicycle holder should be positioned with a clearance of at least 30 to 40 cm from the nearest wall (width of the handlebars should always be taken into account). Should several bicycle holders be positioned beside each other, a distance of approx. 55 to 60 cm is recommended. However different clearance can be chosen if desired. Should the bicycles be positioned in different heights, the clearance between the bicycle holders can be reduced to 30 to 40 cm and this saves space. For this, the suspension brackets should be positioned alternately at the highest and the lowest hole group of the guide rail. The distances stated above are only recommended as guidelines. The actual local surroundings and the sizes of the bicycles must be taken into account. Allow enough clearance between each bicycle holder, otherwise hanging and dismounting bicycles will be more inconvenient than necessary. Please note that the already installed door threshold must be REMOVED before a retroactive fitting of the optional access ramp can be made. The installation of the access ramp is only possible for 2-wing doors. The access ramp may be used in combination with the aluminum floor frame. The access ramp can only be positioned when the doors are open and must be removed before closing the doors! When and where do you recommend the use of an optional aluminum floor frame? The optional aluminum floor frame regardless of the type of foundation represents an ideal addition to our products. When and where do you recommended the use the optional aluminum floor panels? 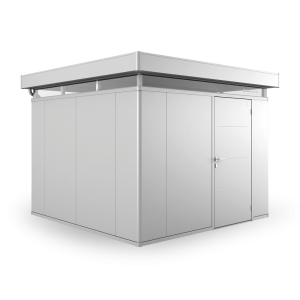 The optional aluminium floor panels, in combination with the optional aluminium floor frame, are a useful addition to the garden shed. Regardless of the type of foundation, both items can be used. The aluminium-floor panels can however only be installed in combination with the aluminium floor frame! Please note that a layer of XPS rigid foam panels with a thickness of approximately 2 to 3 cm (not included) should first be placed under the aluminium-floor panels. How many rainwater drainpipes are needed? Rain water downpipes are offered according to the selected product and are sufficiently dimensioned for the drainage of water on the roof area. You can install max. 2 rain water downpipes on each garden shed. What diameter do the rainwater drainpipes have? Optional rainwater drainpipes are manufactured from galvanized sheet steel in the matching colour for your shed. The diameter of the individual drainpipes is 40 mm. The pipes are designed to fit into a 50 mm drain pipe. How many dustbins or bicycles will fit into a StoreMax? StoreMax 160 2 Bins (placed sideways) 3 Bins 2 Children's bicycles wheelrim up to 22"
"20 years guarantee" - For what, exactly? Guarantee against rusting through of the steel panels and for defective or unserviceable parts. The following are excluded from the guarantee: damages incurred in transit (haulage company is liabe), damages incurred due to faulty or inadequate foundations, due to corrosive materials in the surroundings or the storage of such materials within our sheds and indirect or secondary damage. For wear and tear, moving parts, changes in colour, plastic- and rubber parts the statutory period of guarantee applies. Here you can find our terms of guarantee. We will gladly send the details to you on request. Do I need to obtain planning permission/approval from my community or a magistrate before I erect a Biohort product? As a rule, no! In most countries the local building regulations permit-you to freely position sheds on your own ground. In some cases an application can be submitted afterwards to the local authorities. In many places, one is even allowed to place the shed directly along the boundary. In the assembly instructions for our sheds a "planning application" for such purposes is included. You can also download the application form directly from our website. Our tip: check with your local authorities or government before erecting the shed. Furthermore, we advise you to inform and come to an agreement with your neighbours. Is a wider door available? With the exception of the Shed sizes 1 and 2, the standard door (135 cm wide x 171 cm high) can be replaced by ordering a wider double door (171 cm x 171 cm). Due to the modular construction, the wider door can only be positioned eccentrically in the walls. The surrounding wall panels will be then matched with the larger opening and delivered in the corresponding quantity and sizes. Is it possible to install a second double door in the Garden Shed? The installation of a second double door is possible for all shed sizes of "AvantGarde" (from size L) and "Europa" (from size 3). The doors must be ordered as optional add-on packs. The amount of side wall elements supplied are adjusted to the appropriate number of pieces. Unfortunately the installation of an additional double wing door is not possible for the Garden Shed "Highline"! Can the double door be installed in other positions? 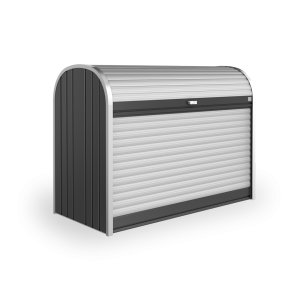 The door can be mounted off-centre or on any shed wall depending upon the shed size. 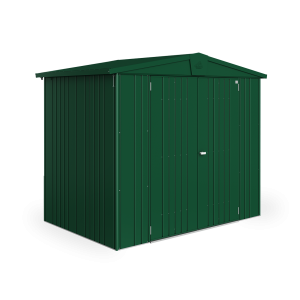 Garden shed "Europa": if the door is fitted in the outer left or right-hand corner of a side wall (below the gutter spout), the drainpipe and storm hooks can no longer be fitted. Are there special sizes available? It is possible to extend garden sheds „Europa“ with an „extension kit“ in a contact spacing of ca. 70 cm depth. A combined Garden Shed "Europa" is provided with one double wing door. However access can be improved by adding an additional double door or even an extra wide door! Special orders regarding width, depth and height are not possible. Can the window unit be installed, at a later date, without too much effort? 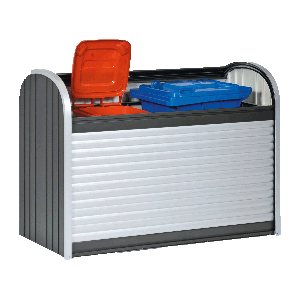 Garden Sheds "Europa" can optionally be equipped with a "window unit" which is corresponding with the size of a sidewall unit. The window unit can also be installed subsequently but keep in mind that additional assembly costs occur. Is it possible to attach the side canopy afterwards without effort? The side canopy (catslide roof) at the garden shed „Europa“ will be attached after disassembling the relevant roof gutter at the existing shed roof. The resulting effort is very little. Can electrical installations be built into the Garden Shed? Electrical installations (such as lighting, power supply, etc.) are generally permitted. Please note that any such electrical installation should only be carried out by a qualified electrician. Please ensure you make the necessary planning arrangements for an appropriate power-supply during the creation of the foundations. Is it possible to plant vegetation directly onto the roof of the Garden Shed? 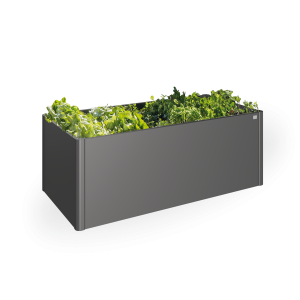 Biohort advises against planting a “green roof” (please note that the weight of a green roof must be taken into account regarding the total roof load). The growth of certain climbing plants such as "wall vines", etc. is permissible. Can the LeisureTime Box be ordered with rollers? Biohort products can't be ordered with optional rollers. Is the Equipment Locker also available with only one door wing? 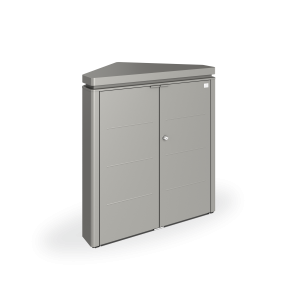 The Equipment Locker is available only with double door. Is the StoreMax also WITHOUT a floor panel available? The galvanized/coated floor panel is an essential part of the "StoreMax" and ensures the stability. Because of this, the delivery of the StoreMax without a floor panel is not possible. Are Biohort products available in other colours? Biohort products are only available in the colours specified. Custom colours are not available. Is it possible to order Biohort products in other dimensions to suit my own personal requirements? Apart from product-specific special solutions no custom-made designs are offered on non-standard dimensions. Can the aluminum floor panels also be retrofitted? For correct installation of the aluminium floor panels, the optional aluminium floor frame is mandatory! If the optional aluminium floor frame is already in place, the floor panels can be mounted at any time with very little effort. Can Biohort products be recycled? I've lost the key for Biohort garden shed - What can I do? You can obtain spare keys for your Biohort-product from the company: Carney GmbH in Germany. Please Note: For the garden sheds „HighLine“ and "AvantGarde model 2016" (fitted with standard cylinder lock) please pay particular attention to keep one of the three keys supplied in a safe place in case it becomes necessary to make a duplicate key! IMPORTANT: Spare keys can only be produced with an original key as a template. In case of the loss of all 3 delivered keys, please contact a key service or forcibly open the cylinder by drilling - note this will destroy the lock! Where can I purchase accessories for my Biohort products? We will try to ensure that CasaNova is delivered within 4 weeks from receipt of order. However, due to seasonal shortages, the delivery time may increase. Nonetheless, throughout the year we can guarantee a delivery time of within 6 weeks. For direct delivery ("free kerbside") it is essential that you provide us with your telephone number where you are can be reached during the day. The shipping company will contact you to agree upon the time of delivery. How is the CasaNova packed? To protect the Annexe from damage during transportation, it is packaged in especially secure boxes. The delivery is always made up of 1 vertical box (for doors and panels) and 2 horizontal boxes (uncoated and coated profiles). Additionally, the wood panels for the roof are supplied on a single non-returnable pallet. If an optional overhead sectional garage door is ordered, this will also be delivered on an additional pallet. All accessories ordered (e.g. floor frame, floor panels, windows, BikeMax, etc.) will not increase the number of pallets. These will be packed in the boxes and only increase the weight of that particular transport unit. Where can the doors be installed in CasaNova? You can choose in which direction (to the right or left) and the position of the doors in any CasaNova. A door will always replace an entire side wall panel of the Annexe. Both the standard and the additional doors can be installed in all 4 sides. A double door can be installed in any of the 4 sides (except size 3x2). However please note, for static reasons you must make sure that additional parts are required for mounting the 4, 5 and 6 m sides (short and long roof uprights, solid cross bar, extra screws and angles, ...) and are subject to a surcharge. The easiest way to test the possible positions of the doors can be found under www.biohort.com/konfigurator. Are the freight charges included in the price? Yes! In Austria, Germany and Luxembourg, we deliver to the dealer or directly to the customer's address. In France, Netherlands, Belgium and Spain we deliver to dealers store. The dealer then assumes responsibility fo the transport to the customer's address. Prerequisite is that the delivery address is located on the mainland and the road is accessible for a 38t truck. "Delivery Free of Charge" is the initial transport from our factory to the delivery address specified (mainland only), curbside, under the condition that the road is passable for a 38t truck. When ordering from a market arrange a delivery week. Approx. 2-3 days before the actual delivery, the shipping company will contact you and the exact delivery date will be announced. Make sure when ordering that you specify a phone number where you can be reached during the day. Depending on the size of the goods ordered, please keep sufficient space free for the delivery. Is it possible to have a 'green roof' on CasaNova? Fine gravel should be laid out around the green area anyway. This will allow you to raise the landscape towards the center of the roof. How long does it take to assemble CasaNova? At least 2 people are required to assemble the CasaNova! Can electrical installations be made inside CasaNova? Are there legal restrictions regarding the erection of CasaNova? The local building regulations vary considerably from region to region. Often these may vary according to the planned building area. Please inform yourself by contacting the local authorities, and ask if a building permit is required before buying the Annexe. A building plan with detailed dimensions and static calculations based on EU valid EN-norms of the CasaNova is available from us. You can also download the static calculations directly from our homepage. A plan of the standard building (with door) can be found in the assembly instructions. If necessary, a detailed plan can be requested directly from us. This will be custom-made for you (depending on the size, arrangement of doors / windows, etc.). What is the max. snow load CasaNova can bear? The roof of the CasaNova is designed to withstand a max. snow load of 215 kg/m². This is the equivalent of about 1.5 m wet snow. Do not forget to include the weight of a possible green roof! Roof avalanches from neighbouring buildings can cause damage to the roof. What form of ventilation is installed in CasaNova? The all-round acrylic glass fanlight has sliding elements on the sidewalls of the shed and these can be opened for ventilation. PLEASE NOTE: if the double glazing option is fitted the sliding function of the side windows is no longer available. Why is it not possible to fit a folding table in size 3x2/4x2? The folding table is hooked into 2 shelf rails. These in turn are attached to the lateral roof uprights. The distance between two roof uprights is 100 cm. The distance from one corner post to a roof upright is however only 93 cm. Since in shed size 3x2/4x2 only 2 corner posts and 1 roof support rail are installed on each side, the folding table can unfortunately not be fitted here. Please note that by all other shed sizes it is not possible to mount the folding table in the corner! Why is the overhead sectional garage door for size 3x3 only available without electric drive? Due to the length of the rails required by the electric drive assembly, it is only possible to fit it from size 3x4 onwards. How many BikeMax can be fitted inside a CasaNova? The BikeMax is mounted on the top and bottom profiles (between horizontal braces). By the numbers indicated above, a space of 1 m between each bike is available. Theoretically, more than 1 BikeMax can be mountedbetween 2 uprights since the BikeMax is height adjustable by up to 11-positions. The door opening angle of the double doors is 120° as standard. Due to the three-hole-position of the gas assisted spring damper, the angle is adjustable up to max. 135°.